beroNet Gateways are connected via LAN and assigned an IP address from the telephone network. Connections to the public telephone network and analogue terminal devices are established using the front ports. beroNet Boxes allow for the installation of various modules. Depending on the module, the front ports are compatible with analogue or ISDN devices. Due to the LAN connection, beroNet Boxes can be easily integrated with a pascom virtual appliance. This function only makes sense in combination with an ISDN trunk located on the same Gateway. 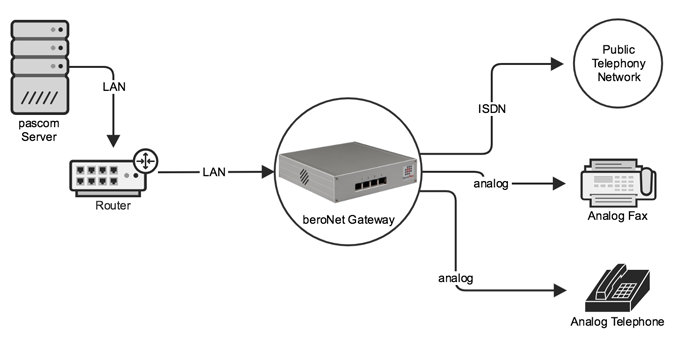 If you wish to use your beroNet Gateway to operate ISDN or Analog endpoints in combination with an ISDN trunk on the same box, then use the option to directly connect the endpoints directly to the trunk without needing to route calls over the complete path to the phone system. Calls will not be converted to SIP and sent over the phone system server, but rather they are routed directly on the beroNet device. If, for example, there is an inbound call for the fax device, the beroNet device will directly connect it to the fax device. The advantage of this approach is that connections are not converted to SIP, which gives superior results when fax applications are used. Direct connections can also be used if ISDN data must be transmitted. The disadvantage here is that the PBX will not be made aware of these calls. Therefore, the server is not able to manage the call flow, e.g. forward the call to another device after a timeout, check for business hours, etc. In addition to that, the ISDN trunk and the extension must be connected to the same beroNet hardware. Whether an endpoint should be routed directly on a trunk or via the pascom phone system can be configured when adding the ISDN or Analog endpoint. The first step of preparation is to mount suitable modules on the beroNet Gateway. If you ordered your hardware via pascom, the modules will already be pre-installed. For further details such as port assignment etc, please refer to the beroNet Documentation. Connect the Gateway to you LAN network, connect the power supply cable and then wait until the Gateway is fully booted (The LEDs on the ISDN / Analog connected mounted modules will be illuminated or blinking - this process can take a few minutes). Should you not be able to determine the Gateway’s IP address, you can find the Gateway in your network using the beroNet Tool bfdetect and if necessary change the IP address. bfdetect only works when the PC running the tool and the Gateway are both located in the same network segment. pascom phone system server’s from version 18 onwards required a minimum of the beroNet Firmware 16 or higher. Under the beroNet Management > Firmware update select the update mode. The pascom instance hosted in pascom.cloud must be able to reach the beroNet Gateway via IP address. This is only possible by using a VPN between the beroNet Gateway location and your pascom cloud hosted PBX. To simplify this process, pascom phone systems include the option of adding a VPN Connector. Wait for the search process to finish, which will only find beroNet PCIe cars, not Gateways! and enter your Gateway’s IP address, netmask and login credentials. and apply your jobs in the job box. Log into the beroNet box web UI and ensure that you have selected Advanced under the GUI mode. Save your changes and the beroNet box will now restart. button and then switch to the Allocation tab. to configure either a BRI or PRI Trunk line . Double-clicking on the field Name. This will open a more detailed view in which you can select which Ports are allocated to the trunk. It is possible to select multiple options here, for example, for a BRI connection multiple NTs are aggregated so they form a single trunk. Under Mode and Technology configure the interface type. For BRI connections, the interface should be set to TE and PTP.
. To help you, use the Trunk Template beroNet Gateway. and switch to the Allocation tab.